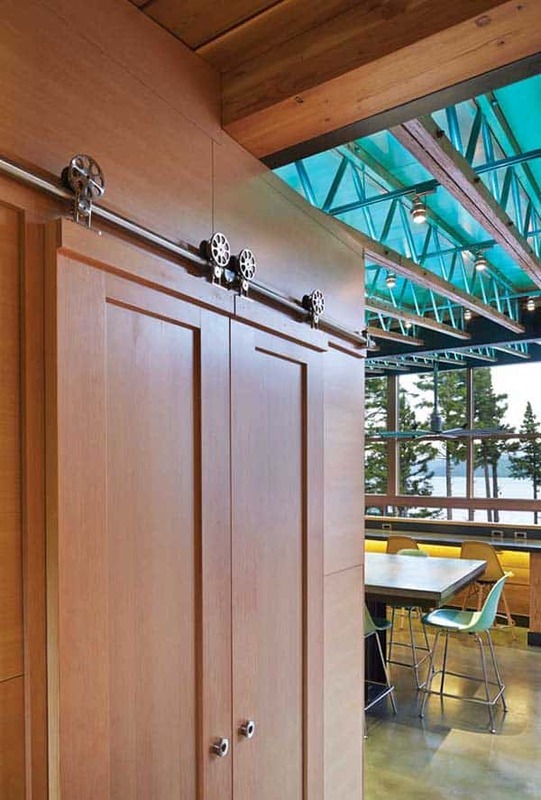 Base Camp is a mountain retreat designed for family living by Johnston Architects, nestled high above Lake Cle Elum in the Cascade Mountains near Roslyn, Washington. 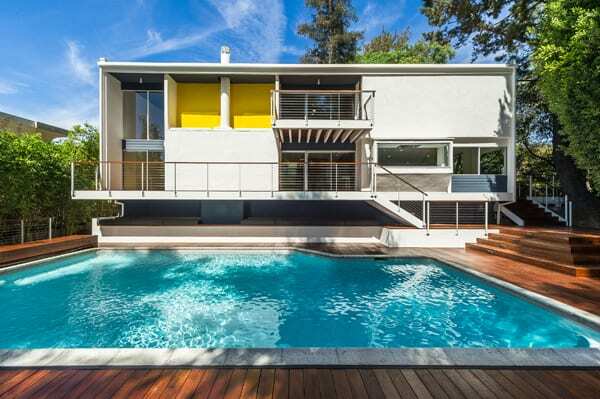 The home was designed as a retreat and eventually a primary home for an active family of seven. The remote lake offers the perfect getaway, enjoying warm summer days and snowfalls in the winter. The home caters to entertaining family, friends and colleagues, sleeping over 2o people, yet most importantly it is the recreational base to enjoy the surrounding rugged mountains. The design of the home caters to the clients outdoor lifestyle, which includes snowmobiling, dirt biking, kayaking and baseball. To house all this equipment, the architects created a spacious gear room constructed with industrial/fire station grade open shelving. Each of the family members have their favorite spaces, the wife enjoys the library while the kids chill out in the theater/game room. A Geochron illuminated world map is situated close to the front entryway, which helps the kids to learn geography. 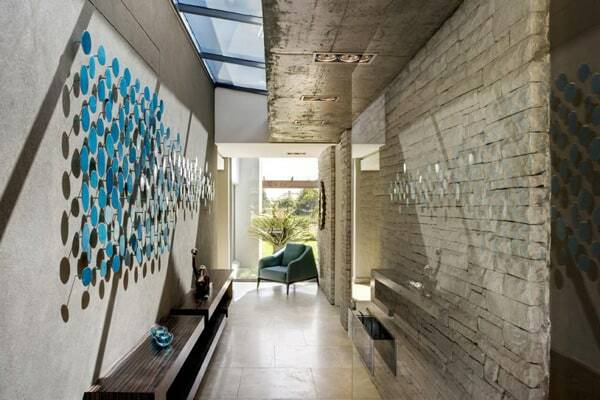 The theme throughout the home is an emphasis on outdoor living, whether it be the astounding views of the lake and surrounding mountains through sliding walls, or stepping outside and enjoying the swimming pool, hot tub, water courses and sauna. The architecture is open and expansive, with large glass walls spilling natural light into the home and engaging it with nature throughout the year. 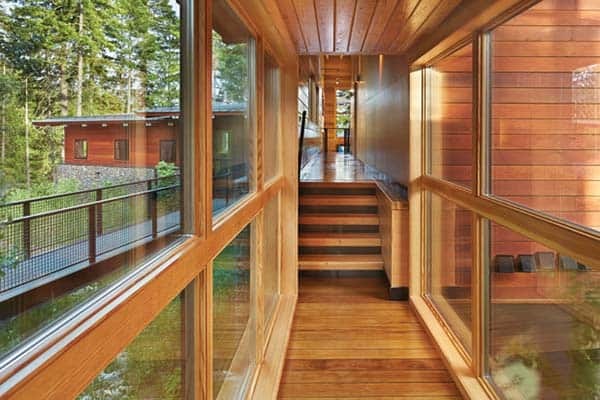 Sustainable features includes “solar thermal, photo voltaics, radiant heat, heat recovery ventilation, super insulation and passive solar design to minimize energy costs.” Most significantly, the design of the home maximizes a diversity of interior and exterior spaces for the enjoyment of work, live and play. 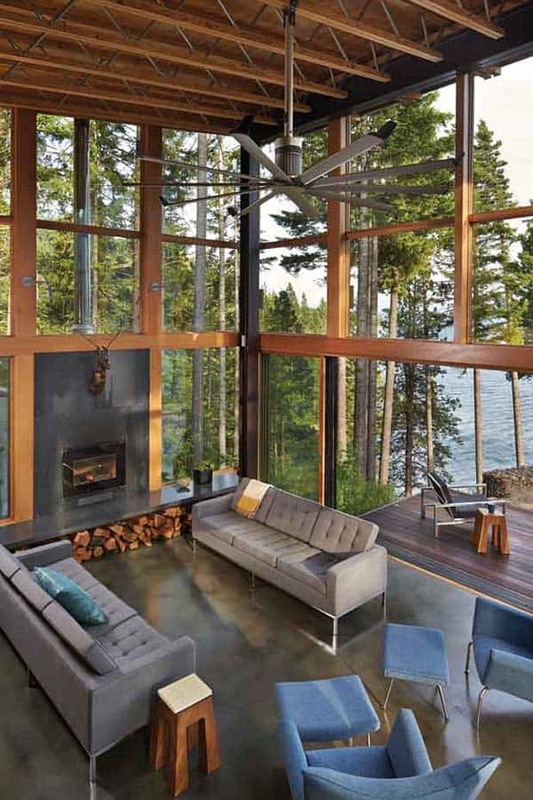 We have featured other beautiful homes here on 1 Kindesign in the mountains of Washington state, have a look at a couple of popular ones: Modern lake house blurring indoor/outdoor boundaries and Breathtaking home set on a bluff overlooking Lake Washington. The interior palette consists of durable natural materials with an exposed structure, soaring ceilings and large expanses of windows. 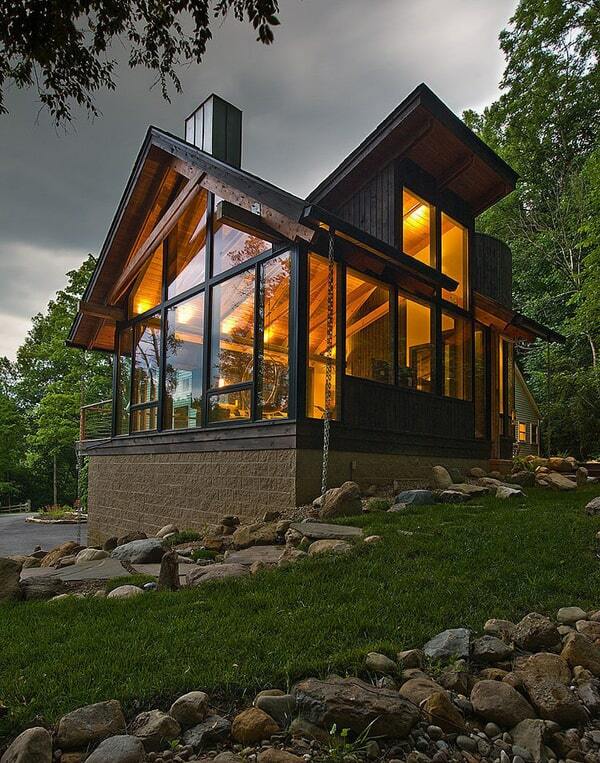 The home not only had to function as a family cabin, but as an offsite workspace for the homeowners, who co-run political consulting firm Mercury Group. The common areas are very fluid, with the kitchen able to accommodate up to ten diners. There is a dining room just below the kitchen that can also double as a conference room. Although rustic, this home has all the technologies of a smart home. 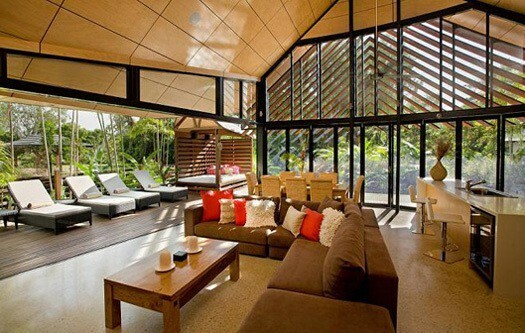 The homeowners can control the systems of their home through three apps on their smartphones. These features includes lighting, heating, fans and even the entertainment system. When they are not at the home, they can keep tabs on their property through security camera monitoring. There are motion sensors in the majority of the room, with programmed light levels that operate according to the time of day. For example, a glowing light will come on in the master bathroom at nighttime. 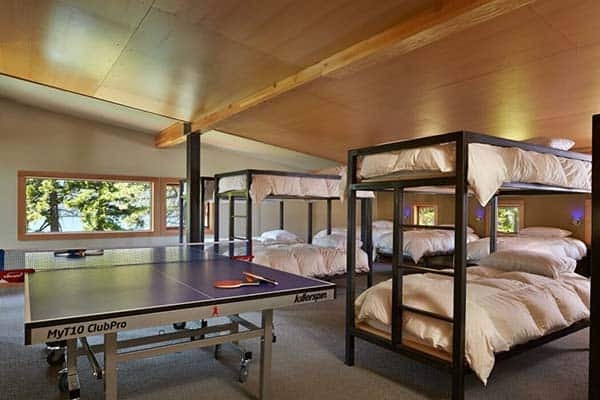 A massive bunkroom sleeps up to 17 people and includes an outdoor sleeping porch. Ninety percent of the property’s hot water is attained from this 1,000 square foot solar array, which will heat the water that is stored in insulated underground tanks.